Our 100% Pure Amagansett Sea Salt blended with imported Herbes de Provence. To our palate, this salt gives foods an earthy herbal flavor and makes food taste "fuller" and "warmer." We use it on steak, lamb, and poultry. We also use it on salad, melon, and hearty fish (swordfish, mako) as well as anything we roast, including whole fish, vegetables, and potatoes. But go easy - a light dressing of this blend is all that is needed. 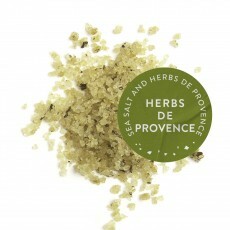 Herbes de Provence is a traditional and tasty mixture of dried herbs typical of Provence, France. Our mixture contains thyme, blue lavender, rosemary, marjoram, fennel seeds, savory, and basil. Try it on a grilled steak, and while the grill is getting hot, put some sliced potatoes, a little olive oil, and a sprinkle of this salt into a packet of foil. The potatoes will be ready by the time the grill has gotten hot, and the steak cooked. Tastes just those huge steaks accompanied with wonderful home fried potatoes we would enjoy at that special restaurant in East Hampton. For an easy and perfect vinaigrette, whisk a pinch of this finishing salt blend together with some olive oil and vinegar. Drizzle the mixture over some greens for an easy and wonderful salad! Maybe wilt the greens a little by serving sliced steak on top.